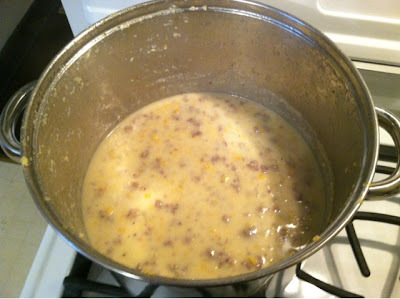 A couple of weeks ago, I made a sausage & corn chowder for dinner. It was pretty easy and very delicious. I'd made a corn & cheese chowder earlier in the year, but I think this one may have turned out better. Probably due to the sausage. Sausage makes everything awesome. Just saying. Anywayyyy, I got the recipe from The Country Cook. I liked it because it wasn't overly complicated, but tasted like I slaved all day. You should try it!